represents the affine space passing through the points pi. represents the affine space passing through p in the directions vi. AffineSpace is also known as a point, line, plane, -flat, -plane, etc. 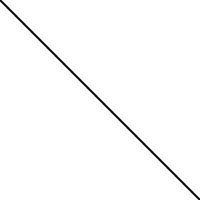 AffineSpace can be used as a geometric region and a graphics primitive. AffineSpace represents the region or . 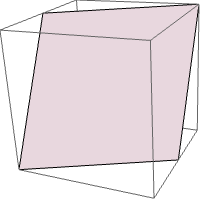 The dimension is k if the pi are affinely independent or the vi are linearly independent. AffineSpace can be used in Graphics and Graphics3D. AffineSpace will be clipped by PlotRange when rendering. For a two-dimensional AffineSpace, FaceForm[front,back] can be used to specify different styles for the front and back, where the front is defined to be in the direction of the normal Cross[v1,v2] or Cross[p2-p1,p3-p1], depending on which input form is used.